Doesn’t every one have this problem? You pop up out of a hole in the ground; you know exactly where you are; you know exactly where you are going; but you have no idea which way you are facing! All it needs is N,S,E,W signs at tube station and subway exits then you wouldn’t get people staning in the middle of the pavement peering at scrappy maps trying to orientate themselves. By convention, the ends of a magnet are labelled North & South to reflect the direction they point when it is freely suspended. The magnetic field of the earth can be likened to a big bar magnet. Question: Approximately where would the North pole of this magnet be located. The speedometers in cars are notoriously inaccurate. This is something we have always known but with the ubiquity of GPS devices with rather more accurate (if lumpy) speed measuring this has become much more obvious. They are always calibrated to read high so that the inaccuracy will never cause you to inadvertently exceed the speed limit. This is annoying. Like most drivers with some experience I don’t read the speedometer very often but judge it mentally, only checking the dial when changing speeds (or spotting a camera, but that is another matter). However, even then, we are judging our speed by a previously learned experience based on an inaccurate instrument. It is really noticeable when stuck behind someone doing exactly what they think is the speed limit when you know that they could be going 5 or more mph faster. The law says that speedometers should be between -0% to +10%(+4 km/h) accurate. As they cannot achieve the -0% by design, they always over read a bit. They work by counting revolutions of the wheels and I thought that part of the inaccuracy was due to tyre wear so I did some calculations. I have 195/65R15 tyres; these are nominally 25″ diameter, i.e. about 807 revolutions per mile. If we assume that a new tyre has about 3/8″ of tread and when worn it is reduced to 1/8″ that is 1/2″ loss on the diameter and now 823 revolutions per mile. This is enough to cause the meter to read 2% fast; certainly significant but not as much as the discrepancy that I observe (nearer 6%). Changing your tyre or wheel size or the differential can make even bigger changes if you don’t get the speedometer re-calibrated. P.S. The ACPO formula for determining speed violations is currently 10% +2mph. Police car speedometers are calibrated -5% to +0% (the other way around to ordinary ones) so that they don’t think you are going faster than you really are. Camera speed traps are triggered at an even higher point than this but not enough to compensate for thinking you were in a different speed zone. Those annoying electronic flashing “SLOW DOWN” notices seem to be randomly set and very inaccurate, often reporting about the car three or more in front of you. They have no weight in law. A House of Lords reply indicated that speedometers are actually manufactured to a -0% to +5%(+10 km/h) tolerance which over-reads still more, not meeting the legal requirement until 120 km/h (about 70mph). In theory when you think you are doing 30 you could be only doing 24 mph though I don’t think many are that bad. The folder My Flash Disk contains the navigation status, e.g. your saved routes and favourite landmarks. The folder Storage Card is a mount point for the plugin card and contains the loadable copy of the navigation software and your available maps. As I mentioned in an earlier post, the backup that ActiveSync makes goes to a file called backup.stg deep under your personal Documents and Settings folder. Using the STGviewer program you can open this and see what is backed up. As you can see, Storage Card is not backed up but we didn’t expect that. I have no idea what Pegasus Databases is. What is surprising (and annoying) is that My Flash Disk is not backed up either so it is no good for backup of these variable but important settings. I would suggest taking a copy using normal windows methods. Initially the My Documents folder on the device is empty but this is where you need to put MP3 files for the built in player. As you can see, this folder IS backed up so the ActiveSync backup function does have some use. The Synchronise files function doesn’t; so, contrary to my earlier suggestion, you may as well leave it switched off. Select the navigation catagory to find the earlier articles in this series. I think I have just about exhausted the subject for our purposes now, though I suspect that other software could be loaded and the device used as a proper PDA but we have no need for that. Just a few other bits of information I have picked up in passing. Use the version of ActiveSync supplied. Only use a later one if required by another mobile device you wish to connect to the same PC. The Advent GPS 400 is also knows as a Transonic T5000 in some places in Europe. As of today there are no updated maps available. The ones on the Medion web site shop are the same as the ones that came with it. If you have a storage card reader/writer, it is a LOT faster than transferring files via ActiveSync. 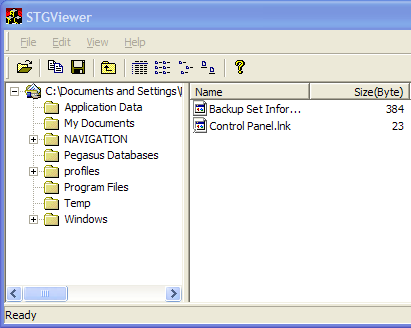 There is a little utility called STGViewer which can extract files from the backup.stg archive to recover just the favourites for instance. ActiveSync is a bit of a resource hog on the PC and has no built in facility to stop it. There is another little utility called ActiveSyncToggle to start and stop it on demand which is useful if you don’t sync very often. This is a follow up to my review of the Advent GPS 400 Personal Navigation Assistant. When you get the device they provide a CD containing a copy of ActiveSync (v3.7.1). This is a Microsoft program that is designed to handle the communication between PDA devices and a PC for things like the synchronisation of address books and the like. Most of that is irrelevant to the GPS though, as it is running Windows CE under the covers, it could probably be made to act like a proper PDA if you loaded the right software. As it is, you can probably ignore most of the features of ActiveSync but it is still worth installing. When you first connect the device it asks you for a name for it and then asks what you want to synchronise. You may as well untick all the boxes as none of them are relevant. When the main ActiveSync screen starts up, select Tools -> Backup/Restore and set it to (incremental) backup each time it connects. While you are at it, you could do a backup now, it will take a few minutes. Subsequently it will back up each time you connect the device but that only takes a few seconds as the only things that have changed will be small files like your favourites. Pray that you never have to Hard Reset the device using the concealed on/off button underneath. If you do then ActiveSync will think that it is a different device and go through the install process again. It will NOT let you chose the same name. As I mentioned to Dean in a comment to the original posting, if you want to copy new maps onto the device you need to open it as a plain storage device. You can do this from My Computer or you can use the Explore button in Active Sync. In here you will find the memory card as “Storage Card”. Just use Windows drag and drop to copy the new maps onto the device … and wait, as it takes a very long time. It is best to do it from the computer hard drive rather than direct from the CD. Then to activate the new map use the big Map button on the front screen (I am embarrassed by the length of time it took to discover this). It will then shut down the navigation and the next time you start it will be on the new map. Note: the device is not capable of navigating across the map boundaries e.g. from England through to France. 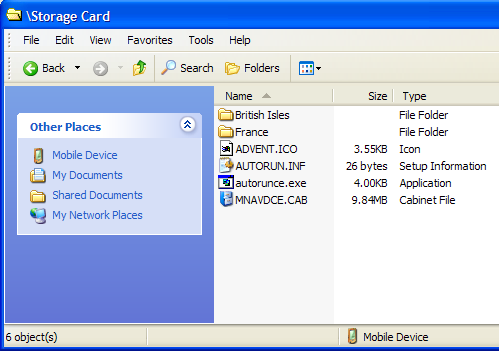 While we are in Explore mode on ActiveSync, it is worth noting that the files that are changed when you store new favourites etc are in the \My Flash Disk\mnav_ucf\ folder. If you want to take a safety copy then copy them by hand into a location on your PC (usual drag and drop or select, copy and paste). Although we have set the machine to automatically backup in the section above and there is a restore command I have no confidence in it and the backup file is in some obscure internal format so that selective restores are not possible. I would rather be safe. 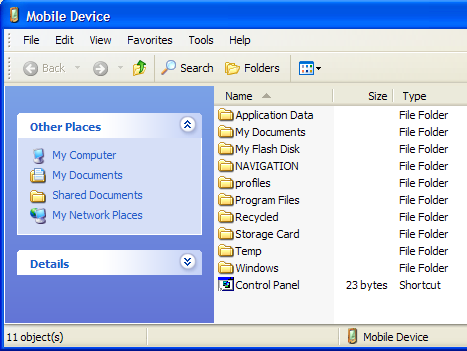 If you want to use the Sync Files feature of ActiveSync then, as far as I can tell, it only synchronises the \My Documents folder on the device with a matching folder in My Documents\DeviceName on your PC and even then I couldn’t get it to work properly—the Sync seemed to work but when you plugged the device in again it deleted them from the PC. If anyone does get this to work then please let me know. Similarly the device has a MP3 Player mode, when I selected Add Song it couldn’t find any—perhaps they have to be in a particular location, it couldn’t find ones that I know were there on a card from another PDA. The navigators do need to get better though. I have commented before about some of the silly roads that they sometimes choose based on a line on the map regardless of true conditions to be found there. There is virtually no information about this device anywhere. I’m sure that there was a promise of a support web site when I bought it, but there is no sign of anything. The Dixons group (Dixons, PC World and Currys) are the only retailers in the UK and they know nothing about them nor do their parts/accessories agency, Partmaster. There is not much about this device on the various GPS forums yet either. The Advent GPS 400 is made by Medion as the, now discontinued, PNA 400 re-badged. Their web shop has some accessories including the external antenna and a Traffic Message receiver which I presume work OK with this model. The box says it uses Navteq software but in fact the software is Navigon 5 (I think v5.1) but with a few modifications, mostly cosmetic; the maps are by Navteq. The only features that I can see are missing are the on-screen qwerty keyboard, signpost information, the info bar and speed limit display and some that would only apply to a PDA device. There is an upgrade to v5.2 on the Navigon download site but I don’t know if it would work with this device. Similarly they have maps available (at a price), including North America, and I imagine these would work with the device. Navteq only sell maps direct for manufacturer’s in-car systems. This is not a comparison with other devices, only having used a hand held GPSr before. Some of the faults may be unique but others may be common to all such systems. The physical device seems to have been designed for a left-hander. The battery bulge/hand grip is on the right and the stylus withdraws from the back left. If you use it the natural way around your index finger tends to switch the screen off or eject the memory card. There is very little in the documentation about the external buttons. Some of the functions are obvious but others are not. The sockets for headphones and external power are close together and very similar, fortunately the plugs don’t engage in the wrong socket. A full set of connecting cables, a windscreen mount and a carry case are provided. Getting started proved very easy following the large format idiot’s guide enclosed. Entering destinations is pretty straight forward so long as you know the full address. It only accepts partial post codes and if this covers more than one village or district then you need to select one before going on to enter the street. In some cases the best bet is to get close and then use the map. When navigating, the directions given are clear and there is plenty of volume from a voice we have dubbed “Sat. Nav. Lady.” Perhaps she says “Please” a little too often but otherwise there are few problems. There is no choice of voice but the volume is adjustable. The use of the phrase “Bear left/right” is sometimes ambiguous meaning either to turn off or just a bend in the road. I think that this is because the system has no concept of priority at road junctions. The A4137 junction with the A48 on route from Hereford to Monmouth was not announced at all. There is a tendency on twisty roads for the apparent position to wander off the road. This can lead to delayed or completely incorrect instructions; in the worst case to “Make a U turn when possible.” I am hoping that this is down to the poor reception behind our metallised windscreen and an external aerial will solve it. The currency of the (UK) map varies. Some very new features are there but some older ones are not. A few junctions are missing altogether (e.g. Sussex Place junction in St. Paul’s, Bristol) and it doesn’t acknowledge mini roundabouts at all. The weakest aspect of the maps is the POI (Points of Interest) data. Many of the petrol stations and garages are incorrect; either missing (from the map), wrong or closed. There doesn’t seem to be any recognition of the quality of roads beyond their classification and sometimes speed limit. Examples are: the A5 between Llangollen and Bangor is very twisty, narrow and slow despite its trunk designation. It is preferred over the A55 Expressway on a journey from Shrewsbury to Holyhead. It also likes the A466 Wye valley road. All routes from our house in Redland to the M32 seem to use Brookfield Lane, a very minor residential road which I wouldn’t dream of taking a car down unless I had to, and then turn right onto the busy A38! Possibly for the same reason, the ETAs given are rather optimistic. It expects you to be able to achieve the designated speed limit at all times and no allowance is made for negotiating junctions. Some adjustment seems to be made for built up areas and the target speed reduced to 20 or 25mph but even that is not enough with modern traffic. I would allow at least 10% extra time for any journey and more if the traffic was likely to be busy. It thinks that the quickest route from Bristol to Bromley is via Central London, ignoring both the M25 and the South Circular. As this was our first use of the device ,we chickened out and don’t know exactly which route it was planning to use. I thought that we had said avoid tolls and expected it to not go into the Congestion Zone but we may have got it wrong. Similarly it has no qualms about taking us over the Severn Bridges in either direction. It comes with the UK maps preloaded and street level maps for the rest of Europe on CD. Together with the large 512MB removable memory card this gives it more potential than many devices on the market. It also runs one of the PDA versions of Windows and a copy of ActiveSync is provided giving the potential to run other software. It comes with an MP3 player which we are not particularly interested in but it may have an afterlife as a picture viewer when the navigation features cease to be useful. Despite some of the rather negative comments we rather like the device. It is easy to use and very good for travelling to places which you don’t know, just that you can usually do better if you do know the roads, however the difference is rarely more than a few minutes.